Hear Ye, Hear Ye, Draw some Birdies? I can’t believe it’s October already and I’ve been blogging every day this year?! Whaaaaa? Time flies. And speaking of flying….time to announce the return of Draw A Bird Day this coming Thursday, the 8th! I’d like to thank A-Wing and A-Way once again for letting us know about the “official” Draw A Bird Day holiday on April 8. Many of us loved it so much that we’ve been celebrating it on the eighth of each month ever since! If you’d like to celebrate our wing-ed friends this month, post your artwork on or about Thursday, 10/8, and let me know, so I don’t miss anyone. I’ll be recapping everyone’s posts later this month (after a creative blogging break I’m planning right after this month’s Draw A Bird celebration). We’d love to have you join us! Happy October morning to you! Hug a tree or sketch a leaf today while singing a happy tune. Make the birdies wonder what you’re up to. Peace. < Day 10: Leaf’s Alive! Happy October Ms Autumn. Woohoo! I hear your woohoo and I raise you a woopwoop! Oh, I like that! Gives him a lot of personality. You certainly captured it warbling Laura. This bird is as green as some of our parrots in Australia. Very nice. I also like the colors and the day is on my calendar. Kirk, every time I think of skipping one of these, you are the first person who pops in my head! 🙂 And I trundle on! Thanks for the reminder Laura, bird day sneaks up on us. I’ll be posting on the 7th. Thanks for posting your very expressive bird today! YAY, the Great October! 😀 Thank you, Jill! Oh how the month flies by!! 😉 This is lovely! ❤️😃And I’ll definitely try another birdie as well! Woot! Looking forward to seeing it, Teresa! Wow, daily for a solid nine months. That is incredible! And, I can almost hear the bird singing! So beautiful 🙂 Not sure if I will join in or not for the bird recap this month, but I’ll try if I am able. Happy creating! Lovely drawing, they look full of song. Cannot believe a month has gone by already…time flies, …like birds on the wing in fact. Looking forward to the recap. Cheers! after completing a month of daily blogging and art, I am in awe that you’ve done this all year!!! I’m in awe too, Rachel! LOL! Thank you. I enjoy it, but it’s a timesucker. Nice movement with your lines. Here’s to October, one of the most beautiful months of the year! (Though, it’s a little yucky right now with the rain.) And many thanks for maintaining the spirit of “Draw A Bird Day” alive on a monthly basis! I love your illustration! Thanks so much! 😀 It’s fun to celebrate them all through the year! Spring here Laura and so the birds are a plenty and I am happy. Love your sketch. Wonderful! Thank you so much, Kath! You’ve blogged every day for a year!!! Congratulations! 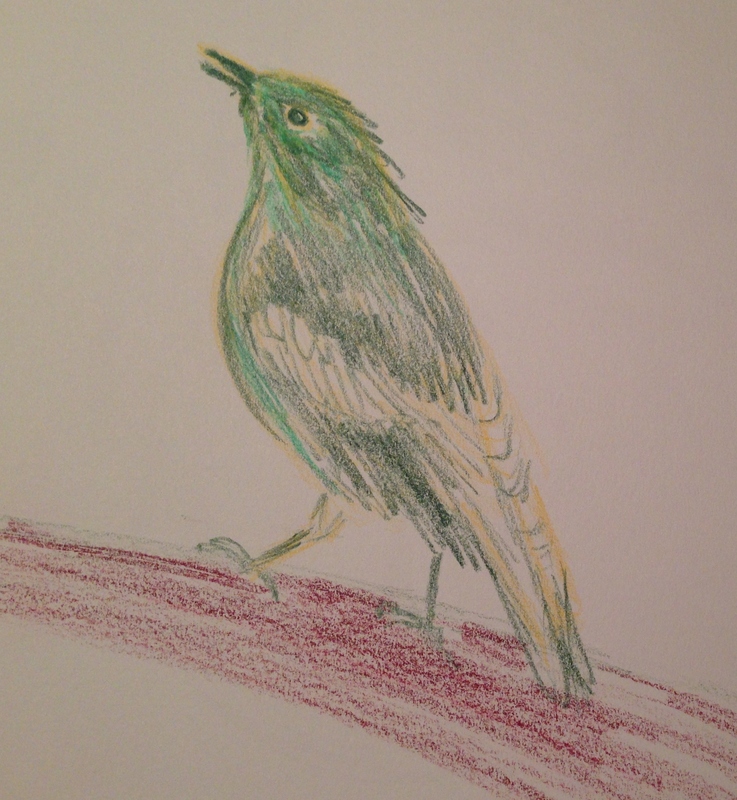 Draw a bird….hmmm, I’ll get back with you! I bought a sketch book last week!! 10 months is closer to a year than not a year!! Right?! I will let you know when my bird is ready!! Yay, really?!? Wooooooooot! So exciting!! I love it, Michael! Thank you for joining us!